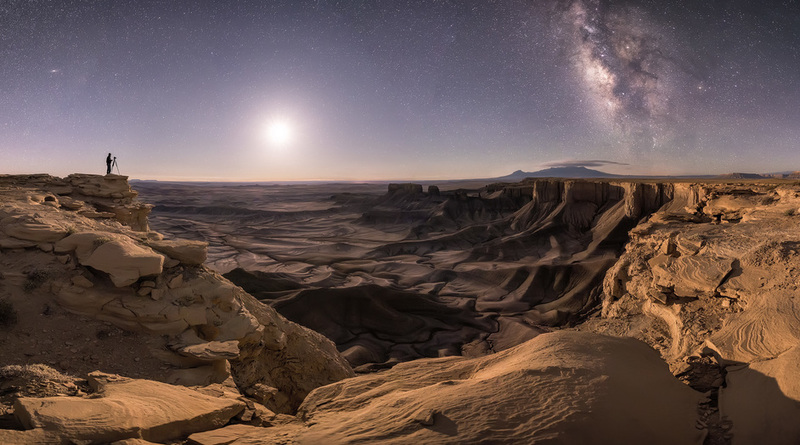 The winning images of Astronomy Photographer of the Year are presented in a free exhibition at the Royal Observatory Greenwich which showcases some incredible images of the sky, from within our solar system and far into deep space. Celebrating ten years of awe-inspiring images, this year's exhibition will be the biggest to date with a new gallery at the National Maritime Museum opening to display the winners alongside some of the best images from the last nine years. Scooping the top prize of £10,000 and claiming pride of place in the exhibition, American photographer Brad Goldpaint was named as the overall winner for 2018 thanks to his image of red rock formations and the Milky Way in Moab, Utah. He also won the People and Space award, which is one of nine categories. Other categories are Aurorae, Skyscapes, Our Sun, Our Moon, Planets, Comets and Asteroids, Stars and Nebulae, and Galaxies. A special Sir Patrick Moore Best Newcomer prize is also awarded to an amateur astrophotographer who has taken up the hobby in the last year and who has not entered the competition before. What are the best dining options near Astronomy Photographer Of The Year London? Astronomy Photographer Of The Year gyms, sporting activities, health & beauty and fitness. The best pubs near London Astronomy Photographer Of The Year. Astronomy Photographer Of The Year clubs, bars, cabaret nights, casinos and interesting nightlife. Where to have your meeting, conference, exhibition, private dining or training course near Astronomy Photographer Of The Year. Photographs showing the wide variety of moons of the Solar System, from our familiar Moon to the lava world of Io and the toxic lakes on Titan. From cheap budget accommodation to luxury 5 star hotels see our deals for Royal Observatory Greenwich hotels, including Hilton London Canary Wharf Hotel from 88% off.